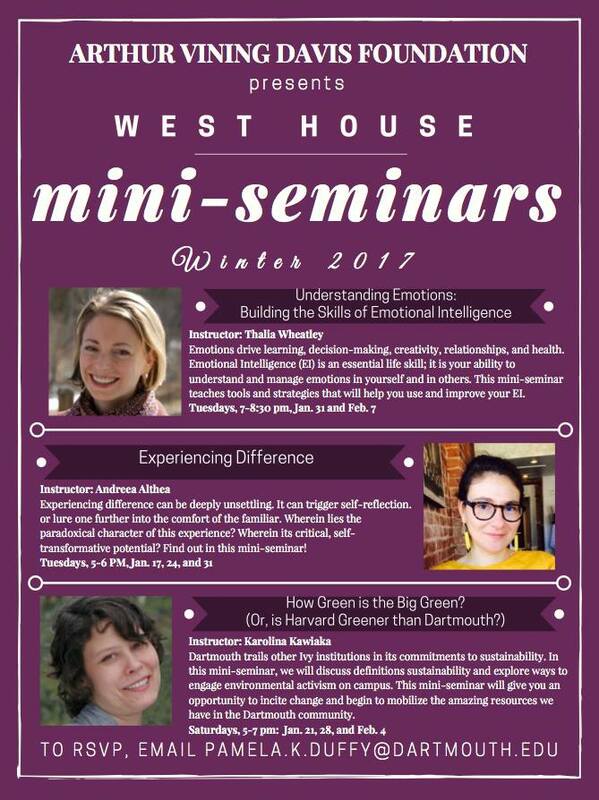 This term, West House will be hosting a series of three mini-seminars by West House faculty, sponsored by the Arthur Vining Davis Foundation. undergraduate deans, professors, staff, and your fellow students. Join us ’17s & ’18s! Come share your adventures. Was your OCP term your best at Dartmouth? Our four Resident Fellows (graduate students who live in West House) offer weekly office hours to provide academic advice, career support, etc. For 2017-18, the Resident Fellows hold office hours together in the Hyphen (between Butterfield and Russell Sage Halls) on Thursdays from 9 to 10pm. Resident Experts (“RezXprts”) are Dartmouth undergraduates who offer tutoring and academic support for introductory courses within each of the House Communities, organized through the Academic Skills Center. They offer facilitated study halls, which for West House are located in the 3rd Floor Fahey Study Space. Students are encouraged bring all course materials, and you will also meet others within close proximity who are in your course that you can study with when the Resident Expert isn’t around. The Resident Experts focus on introductory courses in the following disciplines: Biology (12/13/14); Chemistry (5/6/51/52); Economics (1/10/20/21/22/26); and, Math (3/8/13). Sundays, 12:30 to 2 p.m.
Sundays, 4 to 5:30 p.m.
Thursdays, 4:30 to 6 p.m.
Sundays, 2 to 3:30 p.m.